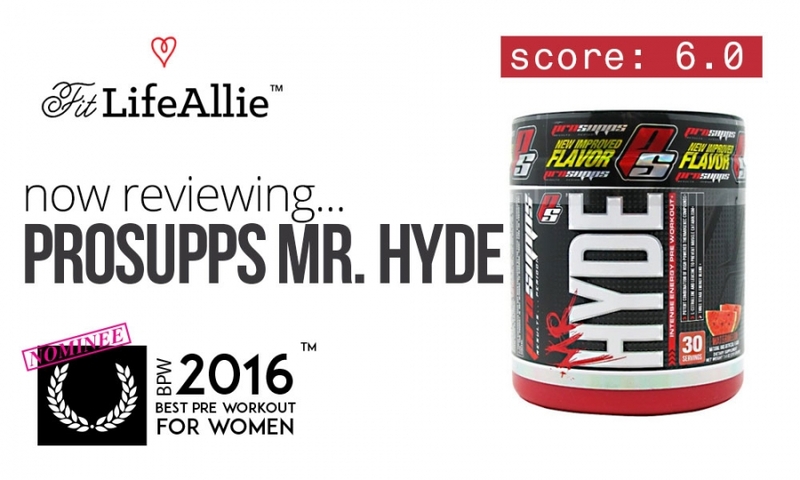 ProSupps Mr. Hyde Pre Workout Review: Too Good to be Safe? ProSupps is a CLASSIC example of the modern day supplement company. Bright colors. Loud labels. Aggressive names. I mean. Mister Hyde? I almost got the willies even looking at the label and reading the name. It screams ‘masc’ all over it and I don’t think it’s a good idea for me to be messing with it in the first place. But of course I did. Because one of my fitties said she set a new front squat PR on it. I mean. I want some of that! So I tried it. And, well, it’s pretty dang good. I’ll start with the flavor. The flavor is just beneath the ‘A’ status for me. I had the punch flavor which I was expecting to be the most classic example of fruit punch- which is a Hawaiian Punch type taste. But this one is different. You can actually see in the graphic on the front of the Mr. Hyde pre workout jar a big ‘ole strawberry sitting right there next to the other fruits. Which is so appropriate because to me this flavor tastes exactly like fruit punch with the strawberry tones cranked up to the max. It’s tasty, really. At one scoop (which is technically two servings), you get a really solid flavoring. I don’t think it’s very ethical to have one serving be a half scoop because you know people are going to take a full scoop anyways without reading the label. But it’s interesting. Right? Like you shouldn’t be allowed to do that. Meh. Getting back to taste- like I said it’s quite good. It’s more sweet than tart, and overall it’s not very overpowering, even at ‘two’ servings mixed in only 10 oz of water (further proof that for all intents and purposes, a real serving is one scoop aka ‘two’ servings). But let’s talk performance and how Mister Hyde works. Yes. The short answer is yes, Mister Hyde pre workout works marvelously well. I took a full scoop aka two servings about twenty minutes before my traditional saturday leg day. And, well, I freakin killed it in there today. I started right into my working sets of front squats from the get-go. I did sets of 8 at 145 pounds. That’s HELLAH heavy for me. You know from reading my blog that I don’t usually put up this kind of weight for front squats. I could feel Mister Hyde powering me to more and more reps with less effort than needed. I’m giving Mr. Hyde a 9.5 on performance. Asterisk. Check the formula section for why I have to include the asterisk. To tell you the truth, this pre workout reminds me alot of EVL ENGN in the sense that it has the ability to push you mentally while at the same time there’s a super strong backend of strength improvement. I refer to my mind and the mental game as the frontend, and the body itself as the backend. Which of course includes my actual backend. A backend aka booty that is already turnt up like crazy from this morning’s workout with this crazy pre workout from ProSupps. So I guess that brings me to the next, and likely most important topic of conversation with regard to this pre workout. Is this stuff actually safe for women? And men, for that matter? Is ProSupps Mr. Hyde Safe for Women? To this, my answer is actually, I don’t know. I really don’t. So in this section we’re going to talk about the supplement facts- pictured below. You can see a few things up front. First of all, there IS creatine and also some agmatine sulfate. You need to know two things about those two ingredients if you are a woman, because my clients (and readers, of course), ask me about those two ingredients all the time. Creatine: This ingredient is going to cause your body to hold more water. I don’t care if you are man or woman, if you are taking creatine, you will have a much puffier look. For guys, that’s a ‘swole’ look. LOL. For ME, if’s a ‘puffy’ look and I hate it. That’s why I stay clear of it if I’m trying to look lean. Agmatine Sulfate: Ok if we’re going to point out Mr. Hyde side effects, we need to talk about agmatine. In my experience this ingredient gives me a major headache. For others, it does not. The agmatine in Mr. Hyde, and all other pre workouts, is designed to assist with the pump. I personally get better pump from lots of citrulline, like in White Flood, which I have done a thorough review on here. Agmatine just gives me migraines. The most important thing we need to talk about in Mr. Hyde is Pikatropin. I know. Sounds like a drug, right? Sounds kind of unsafe, right? Well you might be right. Picamilon aka Pikatropin is a synthetic ingredient designed to help GABA cross the blood-brain barrier more effortlessly. Basically this is why you have super good focus when you take Mr. Hyde. It’s also the reason why I found this product to behave very similarly to EVL ENGN. Because they both have it. But recently the FDA has come out and said that Picamilon is NOT a dietary ingredient. Now. I don’t know exactly what the ramifications of that decision ARE, but I can say that supplement companies are already back-pedaling and trying to re-formulate frantically to pull this ingredient out of their products. Super interesting, right? I think so. But yeah. Just thought you should know. If the FDA thinks Mr. Hyde isn’t safe, than safe to say this pre workout probably isn’t safe for women and men to be taking consistently. I know I won’t be taking it. But let’s about the label design anyways. I think that means I HAVE to give Mister Hyde a failing grade of 6.0. So sad. You know what they say about things being too good to be true, right? If something is too good to be true, it probably is. I’m a tomboy I guess. (‘You GUESS, Allie?!’). LOL. I know. Ok. I AM a tomboy. I feel like deep down inside, or maybe in another life I was a dude. No this is not me coming out of the closet. This is me, in a very roundabout way, saying that the ProSupps Mister Hyde label speaks to me. I just like it. I think it’s stylish. The ProSupps logo is big and bold, and is an unapologetic statement of individuality right there on the face of the label. These labels also have a wonderful and distinctive texture on the label. Kind of like C4 has that ‘carbon fiber’ thing going on, Mr. Hyde has some bumpiness that is pleasing to the touch. Another thing that I really appreciate about this pre workout is the red tub. The color is unlike anything else on the shelf that I’ve ever seen. It’s a much deeper, crimson red that tells you that this pre workout is unique and walks alone. I think that’s a good transition to our Mr. Hyde pre workout summary. Sigh. I really wish Mister Hyde didn’t include that Picamilon. Because I really did have a fantastic workout on this pre workout. The price point is fair, and the stuff tastes great. I do hope that they can find a way to capture this same effect in a Picamilon free version. I’m sure they will. After all, this version is a ‘DMAA’ version of the original. They’ll just go out and find the next questionable ingredient to put in here, I’m sure. But for this version I have to give it a failing grade.